Today is more than a memorial day. It is more than a memorial day, since the Nakba is continuing until today. We are here not to mourn the catastrophe of 1948 in Palestine, but to celebrate the resistance as well. The Nakba continues, and so too must the resistance. The resistance against the expulsion and displacement from Palestine, against the colonization and against Zionism, is not only the resistance of a rock against a tank, or of a consumers´ boycott against profiteers of war. It is also the resistance against the zionist narrative, the writing of history by the alleged victors, a narrative that is dominant in classrooms, in books, in newspapers and everywhere. The Palestinian struggle and the solidarity with it also means breaking this narrative, and with it the silence of 1948. The problem in Palestine lays in the expulsion and ethnic cleansing of 1948 and cannot be solved without the return. Geographic division or hypocritical accords cannot lead to a just solution. The existence of Israel is denying since 68 years the return of the refugees, who are doomed to live in exile in the poorest condition for almost seven decades now, and as long as the Zionist state as an ethnocratie has control over Palestine, there will be no just solution for the refugees. 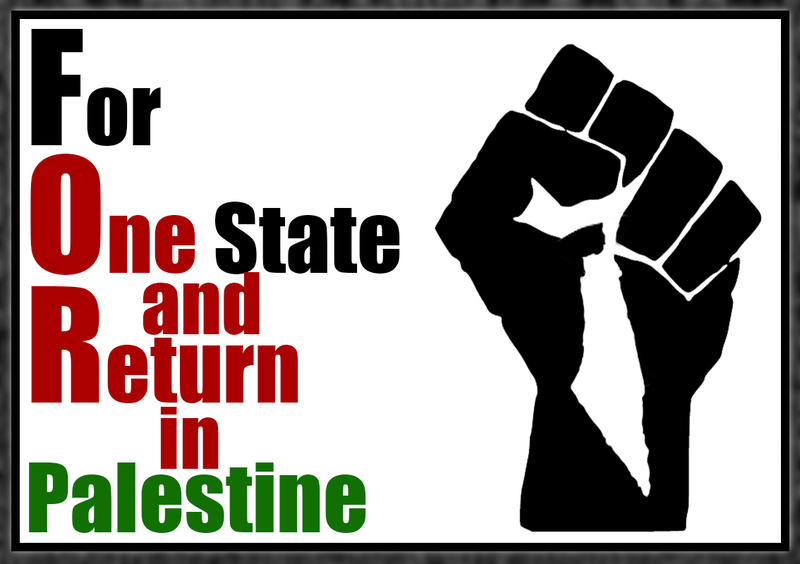 The demands for the return and the abolishment of the zionist regime in Palestine are for many people in Germany a thorn in their side. The demand for justice is seen as a demand for murder and genocide, since the life of one ethnic groups seems to be more important than the life of another. This proves to us exactly how important it is to combat this narrative. The founding of the zionist state in 1948 is seen by many German people as a sort of redemption for the crimes committed by the generation of the Nazis, and as an event which allows Germany to put the holocaust behind it. When we say loudly and clearly that this event was an unjust catastrophe, we deny Germany its deliverance. 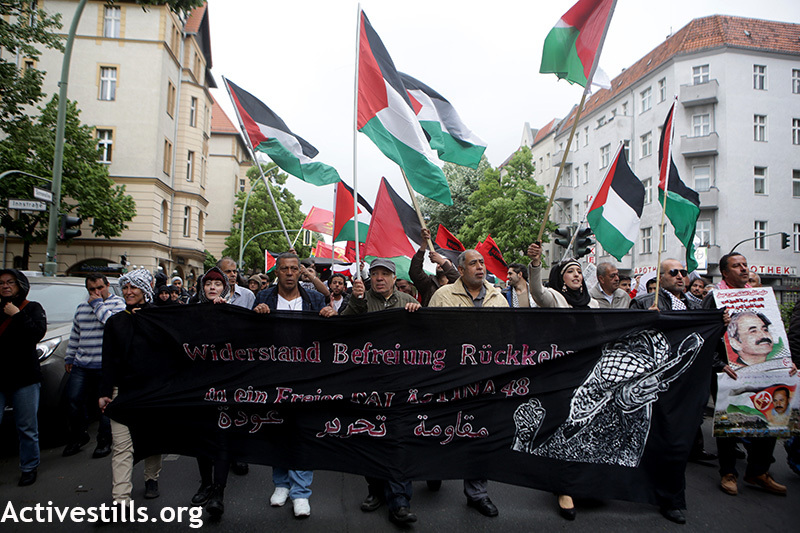 Still, the people in Germany must acknowledge the Nakba, und should not see the situation in Palestine merely through their own sensitivity, a view which allows them to put themselves in the victim´s position and to not see that they are ongoing perpetrators and enablers of crimes. For this reason, on this 68th memorial of the catastrophe, we also call upon our non-Palestinian comrades: solidarise, continue to educate yourself, inform yourself. Question the writing of history here in Germany. The critical examination of the hegemonic narrative is necessary for the political understanding of the Palestinian question. We are very glad to take to the streets with you today, and to march with you down the long road of international solidarity. Freedom for Palestine! Long live the international solidarity!